We are sending the wrong message with the majority of our organization’s learning opportunities. Our programs often end with a certificate of completion, CEU credit or some type of recognition. It implies that the learner is done. The learner has arrived. That learners have completed all that is required of them. The real work actually begins when the education session ends. The real work is the effort the learner uses to transfer and apply the new knowledge and skills so that it improves their performance. We need to redefine the end of a learning opportunity. We need to classify it as improved performance at work. Not a certificate or CEU credit. The most effective learning programs move the finish line to several weeks or even months after the education session. Then the learner has to provide some type of evidence of improved performance. That they actually applied the information they learned. Improved performance becomes the requirement for satisfactory completion. Completion must reflect progress toward improvement. It’s time to move the endless learning loop. The education event paradigm. What is that learning loop myth? The misguided belief that simply attending the education session is sufficient. We’ve got to redefine the learning finish line. We need to raise the bar and make on-the-job application the successful completion of a learning experience. We need to make “a change in behavior” the requirement for completion. Not the end of an education session. As learners start applying their new knowledge and skills, we need to provide them with feedback. We need to let them know how they are doing when applying the new learning. We need to monitor and tell them if they are headed in the right direction. We can still recognize and acknowledge the effort, time and energy of the learner during a class and during application. Ultimately, we hold the final recognition to when the learner applies the new knowledge successfully to their job and has improved performance. That’s when real attitude, behavior and skill change occurs. Adapted from The Field Guide To The 6 Ds by authors Roy Pollock, Andrew Jefferson and Calhoun Wick. 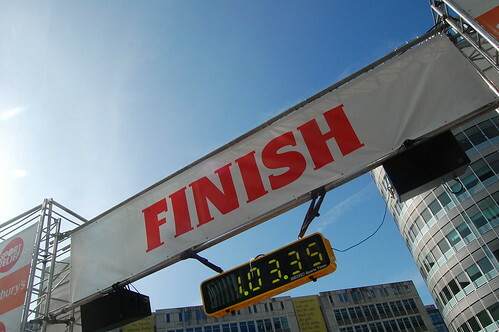 What’s holding you back from moving the learning finish line? How can changing your own internal paradigm from learning events to learning process and learning performance change your focus on education sessions? Love this idea! The hard part would be finding a way to do the monitoring to see if performance really has improved. It can be done, of course (continuing medical education providers do this for a lot of their activities), but it gets exponentially harder the more learners you have. And you may have to rely on self-reported data, which is always a little iffy. How do you see this playing out for a large association conference? As always, you provide great additional thoughts and questions. Thanks for adding those. I think the model is already in place. For example, the Texas Board of Nursing certification requirements are on the honor system. The Board does spot checks to see if people actually have the documentation to prove they attended specific education sessions. This model could easily be applied to outcomes based education…changes in practice and profession. Let’s face it, passing a knowledge based exam doesn’t mean one has the skills to apply it. An interim step could be scenario-based exams where applicants have to describe how they would respond to specific circumstances. At least that would be a step in the right direction.